I am loving blueberry season! And I love blueberry jam! We finally got to go and pick some of the tasty little morsels today! We freeze, dehydrate and jam ours, as well as eat fresh. As a matter of fact, my kids can easily put away 10 lbs of fresh berries in an afternoon, if I let them. I am working on making my life a bit easier, and not cook so much in the summer heat, so I knew I had to come up with a different way to make some fresh jam. After searching and scouring the internet, I found a couple that I liked that kept the blueberries raw. Of course, me being ME, I tweaked it up a bit. And here’s what I came up with! 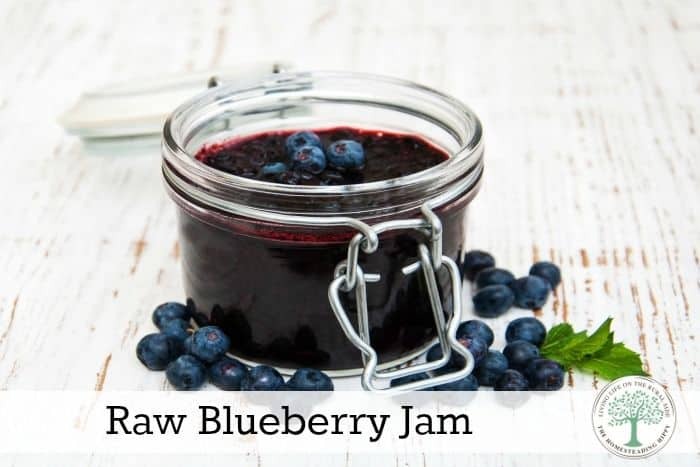 A raw blueberry jam recipe that is simple to make, and only uses 4 ingredients! You can double, or triple this recipe and freeze some for later. The best part is that it uses no pectin, and honey is the only sweetener. After the chia seeds have soaked in the water for 10 minutes, they will begin to “gel” and that is what holds the jam together. Mix all the ingredients in a food processor or blender for a few minutes, and viola! You have jam! Serve over biscuits, or homemade bread. Or stir into yogurt for a special treat! Holy cow, that is genius! I LOVE chia seeds seeds and blueberries, so gonna make this. How long would this keep in the fridge? I love this recipe! So easy and yummy! The article says it uses 4 ingredients but then only gives 3 ingredients. What did I miss?